In a medium-sized bowl combine maple syrup, orange juice, oil, butter, salt, pepper and Sriracha sauce. Whisk to combine. In a one gallon-sized zip-top bag combine Brussels sprouts and maple-orange glaze. Toss to completely coat the sprouts. Line a large baking sheet with aluminum foil and spread sprouts out face-down on the sheet. Try not to overlap any of the Brussels sprouts. Bake sprouts in preheated oven for 35-40 minutes. Toss sprouts and add walnuts. Continue baking for another 3-5 minutes, or until walnuts are slightly toasted. 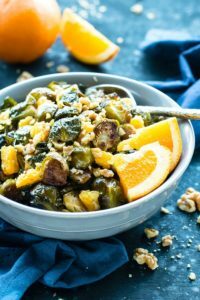 Serve Brussels sprouts immediately with orange pieces and enjoy!